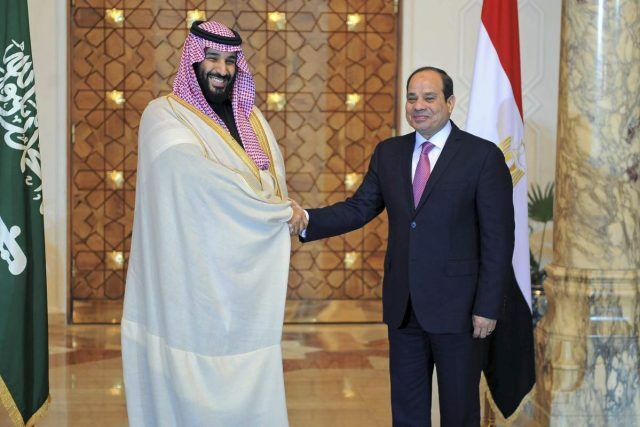 Egyptian President Abdel-Fattah el-Sissi greets Saudi Crown Prince Mohammed bin Salman in Cairo. Saudi Arabia’s powerful Crown Prince Mohammed bin Salman has described Turkey as part of a “triangle of evil” along with Iran and hardline Islamist groups, Egypt’s Al-Shorouk newspaper reported on Wednesday. The Saudi prince also accused Turkey of trying to reinstate the Islamic Caliphate, abolished nearly a century ago when the Ottoman Empire collapsed. Turkey has also worked with Iran, Saudi Arabia’s arch-rival in the Middle East, to try to reduce fighting in northern Syria in recent months, and Iranian and Turkish military chiefs exchanged visits last year. The prince spoke to Egyptian newspaper editors during a visit to Cairo, on his first foreign trip since becoming heir to the oil-exporting giant last year. However, the Crown Prince said Qatar would not be barred from attending an Arab summit hosted by Saudi Arabia later this month.